French President Francois Hollande has described the US-Russia deal on Syria's chemical weapons as an "important step" towards the much bigger goal of a political solution to the civil war. But in a TV address Mr Hollande said: "The military option must remain; otherwise there will be no pressure." Mr Hollande said a vote on a new UN Security Council resolution on Syria could be agreed by the end of the week. On Monday he will meet US Secretary of State John Kerry to discuss the issue. The president said sanctions will be enforced to coerce Syria into dismantling or handing over its chemical weapons if Damascus fails to comply. "It is necessary to include the threat of sanctions if the agreement and the aims of the Security Council resolution aren't carried out,'' he said. "But the next step has to be finding a political solution to the Syrian crisis." On Monday Mr Hollande and his Foreign Minister Laurent Fabius will meet Mr Kerry and British Foreign Secretary William Hague to discuss the wording of the new draft resolution. The BBC's Christian Fraser in Paris says that France takes a hawkish position on Syria - and a majority of French people think it is too hawkish. But the government has made a commitment to the Syrian coalition and it is worried that the US-Russia agreement will strengthen the position of President President Bashar al-Assad. Mr Hollande said that there is no place for President Assad in a future Syria - "not him and not the jihadists". Our correspondent says that the president's refusal to rule out airstrikes - which are still seemingly still on the table - was tough talk. But it is not yet clear whether his views will be reflected in the UN resolution once it is finally approved. President Obama on Sunday also welcomed the agreement as a "foundation" that could eventually lead to a political settlement of the Syrian civil war that has killed tens of thousands of people over the last two years. He said that the US was in a "better position" to prevent President Assad from using poison gas again because of the deal hammered out by Mr Kerry and Sergey Lavrov, the Russian foreign minister. After being first drafted in Paris, the UN resolution will be taken to Moscow where it will be validated by President Vladimir Putin. Russia and China have consistently blocked resolutions at the UN Security Council designed to introduce sanctions against President Assad. On Sunday a Syrian government minister said that the deal was a "victory" that averts war. The framework document says Syria must provide full details of its chemical weapons stockpile within a week - with the arsenal to be eliminated by mid-2014. The US had threatened to attack Syria which it blames for a chemical attack in August which killed hundreds. President Assad's government denies the allegations and has accused the rebels of carrying out the attack. The UN's chief chemical weapons inspector has handed in his team's report into the incident to Secretary-General Ban Ki-moon. UN spokesman Martin Nesirky said that the secretary-general will brief a closed session of the Security Council on its contents on Monday morning and will also brief the 193-member General Assembly later on in the day. Syria recently agreed to join the global Chemical Weapons Convention, and the UN said it would come under the treaty from 14 October. The framework deal was announced on Saturday after three days of talks in Geneva between Mr Lavrov and Mr Kerry. "We welcome the agreement," Syrian Reconciliation Minister Ali Haidar told Russian news agency Ria Novosti, giving his country's first reaction. "It's a victory for Syria achieved thanks to our Russian friends." However the timetable for the process is described by analysts as extremely ambitious. It envisages Syria providing a full inventory of its chemical weapons within one week, all production equipment being destroyed by November, and all weapons being removed from Syria or destroyed by mid-2014. Mr Kerry and Mr Lavrov said that the UN resolution could be sought under Chapter VII of the UN charter, which allows for the use of force. But throughout the Russian foreign minister has insisted that force should remain a last-ditch option. The US believes the materials are located in 45 sites, all in government hands, half of which have useable quantities of chemical agents. But it is thought that Russia does not agree on the number of sites, nor that they are all under the government's control. On Sunday the Syrian National Coalition, the main umbrella opposition group, demanded in a statement that the ban on chemical weapons be extended to the Syrian government's use of ballistic missiles and air power against civilian population centres. 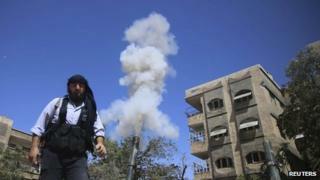 Fighting continued inside Syria on Sunday, with heavy shelling reported by government forces on suburbs of Damascus, where fierce fighting has been taking place for several days. Millions of Syrians have fled the country, mostly to neighbouring nations and millions more have been internally displaced within Syria.